Malta is really quite special. While small, you´re never short of beautiful places to explore and experience. Most travellers underestimate Malta´s charm and might typically book a long weekend thinking it’s all that´s needed to know what the island has to offer. On arrival, though, they learn the reality soon enough; while bus connections may be good, journey time on public transport can be painfully slow. It took me one and a half hours to reach Mdina from St. Julian’s by bus, a journey of around 8 km. After the long ride from the airport to the Hilton, I realized that I wouldn’t be able to see much at all if I relied on public transport. As I don´t drive, hiring a car wasn’t an option although even if I did, I´d probably have got quite stressed by the chaotic traffic. The last thing you want during your holiday is to hire a car and get involved in an accident. 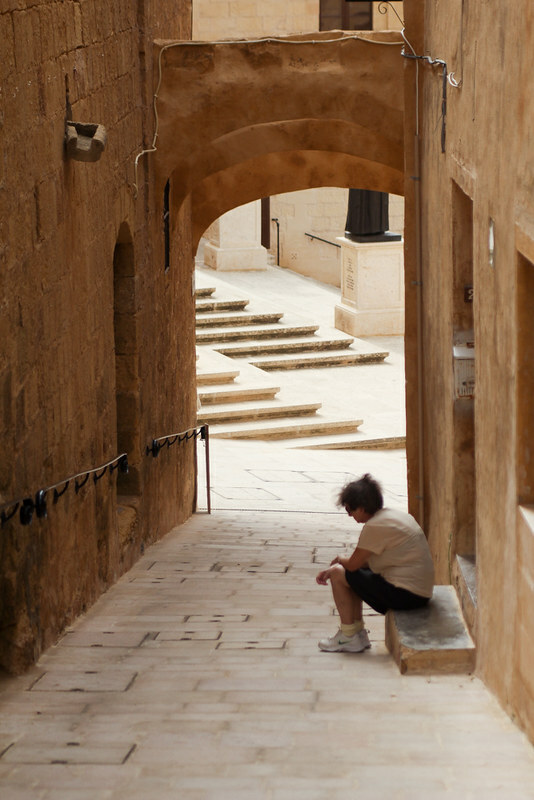 The best way to explore Malta is through a private tour, there’s no doubt about it. Whilst I was searching for the best tour to suit my needs, I stumbled on Karlito’s Way. 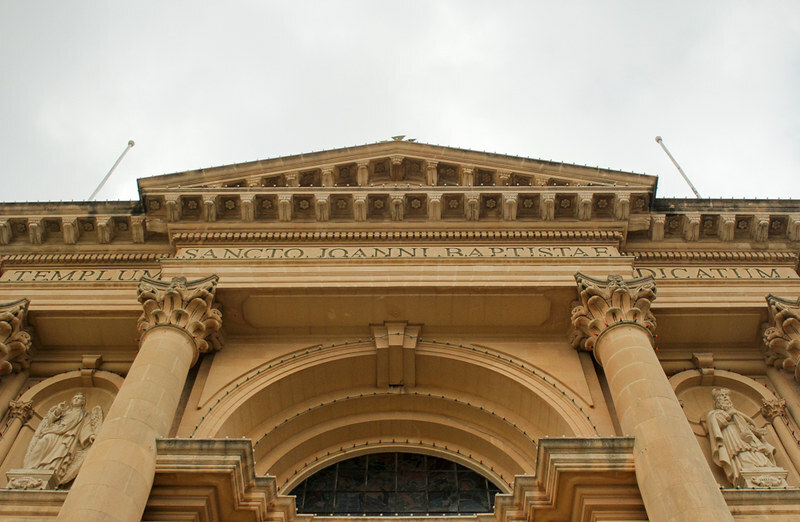 Their website was quite inspiring so I contacted them for a tour around Gozo. It´s worth noting that their tours are tailor- made so if you want to see or do anything special all you have to do is tell them and they make it possible. They can take you swimming with tuna (did you know Malta is one of the few places in the world where you can do that?) or teach you to make bread (did you know how important bread is in Malta?) or you might even end up invited to a fisherman’s house for lunch! Fast-forward to Saturday morning at 8:15. Lovely Therese was waiting for me in the hotel lobby. Before embarking the ferry to Gozo, we passed through Mellieha to pick up an adorable couple who could inspire every traveller, I think! Although I guessed they´d been retired for a while, they were really young at heart and always on the road! Don used to be a pilot for American Airlines and he laughed when he learned of my flying fear. He told me that the most dangerous part of it is the drive to the airport! Sue was the planner of the family, an outstanding researcher and full of energy. They´d travelled from Alaska, where they encountered polar bears and were en route to Romania for a Danube cruise followed by a trip to Antarctica. It was their third time there too! I´d love to still have the travel bug and be on the road when I reach their age, never losing that sense of excitement. Gozo is like the little sister of Malta, smaller with an older lifestyle. While in Malta you´ll find modern buildings, traffic jams and a lively nightlife, Gozo is more about find peace and quiet. It remains an unspoilt oasis of stunning landscape, remote beaches, golden stone villages and churches that are larger than England’s cathedrals. 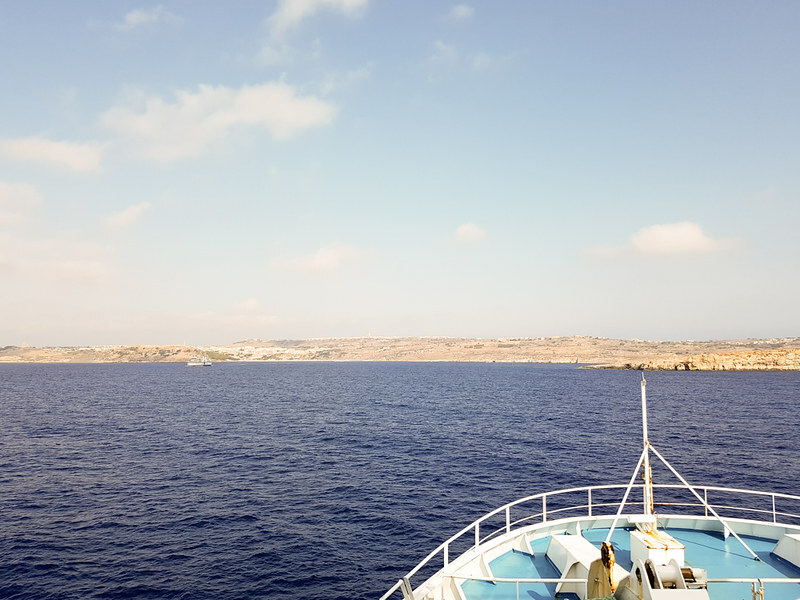 The most convenient way to get to Gozo is by ferry (I’ve heard there´s a sea plane too) and although they don’t really follow a timetable they do run until late at night. The crossing takes around 20 minutes and you can enjoy it from the panoramic deck. The ferry passes near Comino Island and you can spot the boats taking tourists to the famous Blue Lagoon, with its cyan coloured water. Comino´s population is made up of just four permanent residents and doubled as the set for a number of films including The Count of Monte Cristo, Troy and Swept Away. Our first stop in Gozo was the village of Xewkija where we visited the Church of Saint John the Baptist, known locally as the Rotunda of Xewkija. The church was built small but as the village population grew (now the 4th largest in Gozo) so too did the need for a bigger church. The new church was built around the site of the original one so that the people could still go there to pray. When ready, the original church was demolished and rebuilt in an adjacent building under the new church’s belfry. It has since been transformed into a museum with the original sculptures and paintings. A local man goes there several times a day to ring the bells. 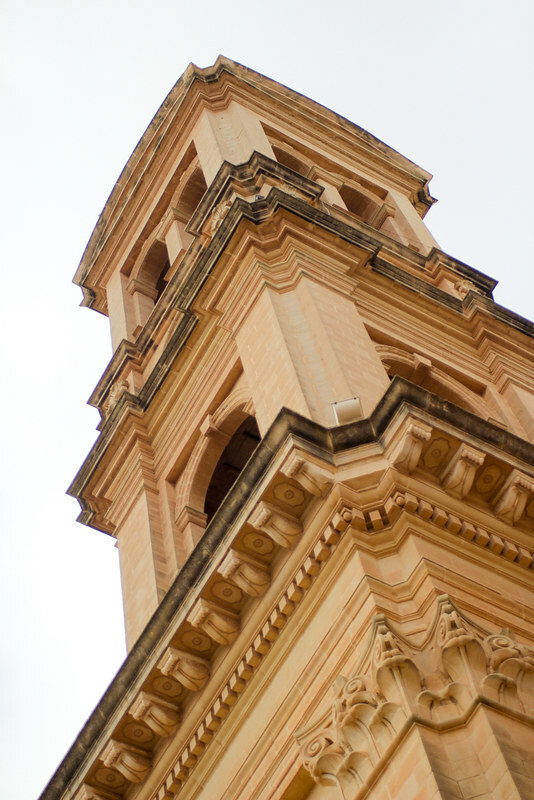 The Rotonda is the largest church in Gozo and can be seen from all parts of the island. 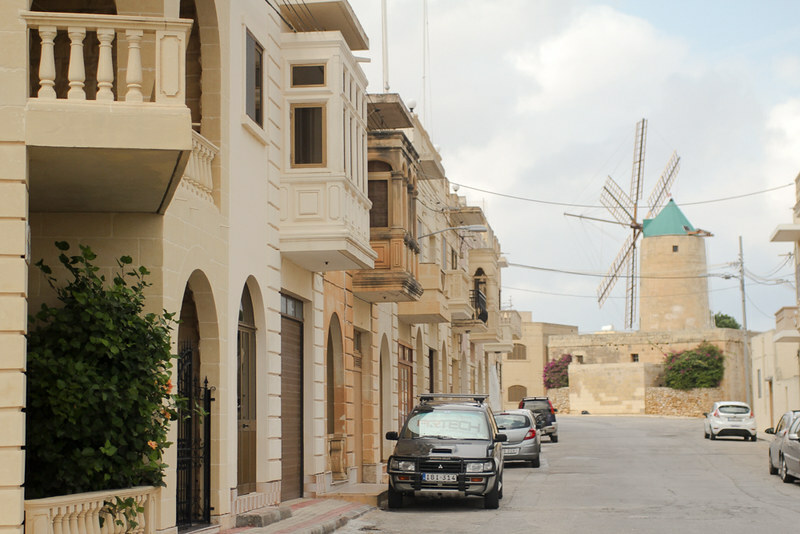 Driving through Gozo´s villages I couldn’t help but notice the beautiful architecture of the farmhouses. The layout of a farmhouse is like a cube and rooms are connected by an outdoor staircase. Theresa told us that these days farmhouse owners have divided them into separate buildings, added pools into their gardens and transformed them into guesthouses. The typical Gozo village is very picturesque and reminds me of traditional Arabic stories. Every house has a beautifully decorated balcony which looks like it´s been borrowed from Arabian Nights. Despite being a Saturday the streets were quiet and the island often looked deserted. It was just us and the tiny lizards. Our next stop was the citadel of Gozo, The Cittadella, in Rabat (Victoria) – the island´s capital. It´s been recently renovated thanks to an EU project and hasn’t long been open to the public. When you enter the underground grain silos you can see that the walls are still wet, a sign of the recent work that took place. The Cittadella dates all the way back to the Bronze Age, as archaeological remains prove. 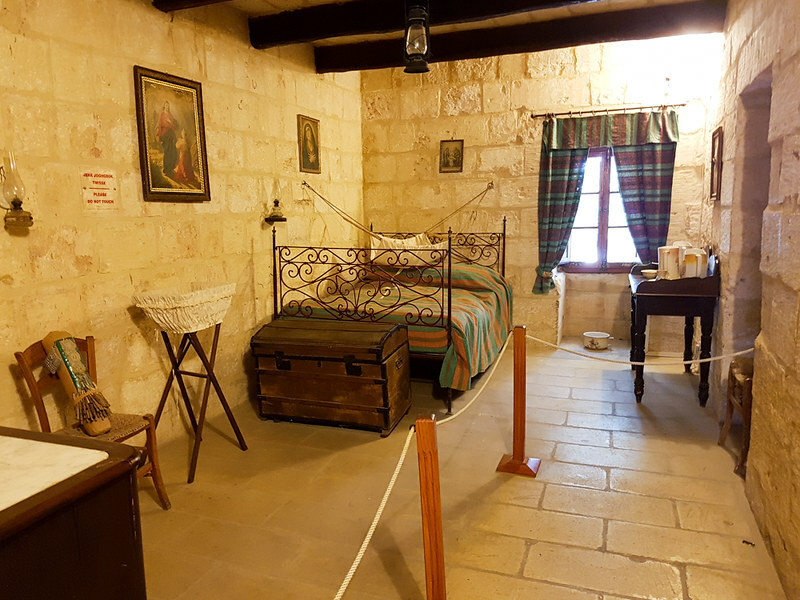 Being on top of a hill with full island views must have had strategic benefits as the Victoria area played an important part in Gozo´s history. I could only look at the remains and guess how the fortified village must have looked in the past. Therese pointed out the arches in the architecture and told us how in the past, because of the stone-on-stone way of construction, they were crucial elements in the structure of a house. 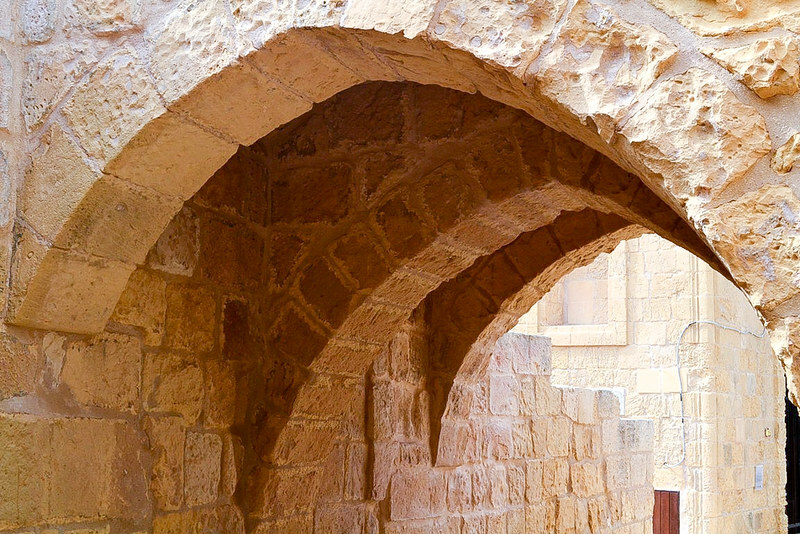 Even today, old houses from Valletta still have arches over the doors. The Cittadella has an old prison, now converted into a museum. People who commit crimes are judged in the Court of Justice which is next to the prison. Don’t worry, though, Gozo is a very safe place! The last major crime committed was years back when someone sneaked in from Malta during the night and stole some windows. 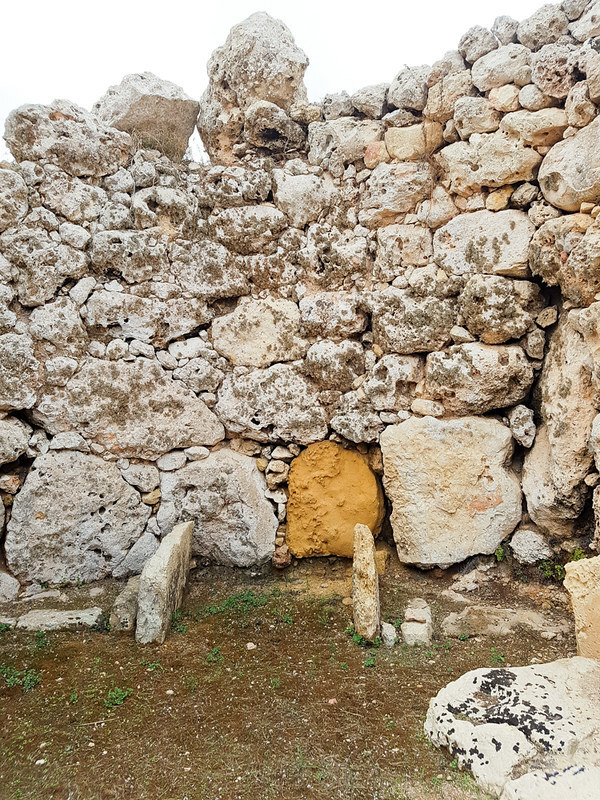 Before stopping for lunch we went to the village of Xaghra to explore the Ġgantija megalithic temple complex from the Neolithic period. 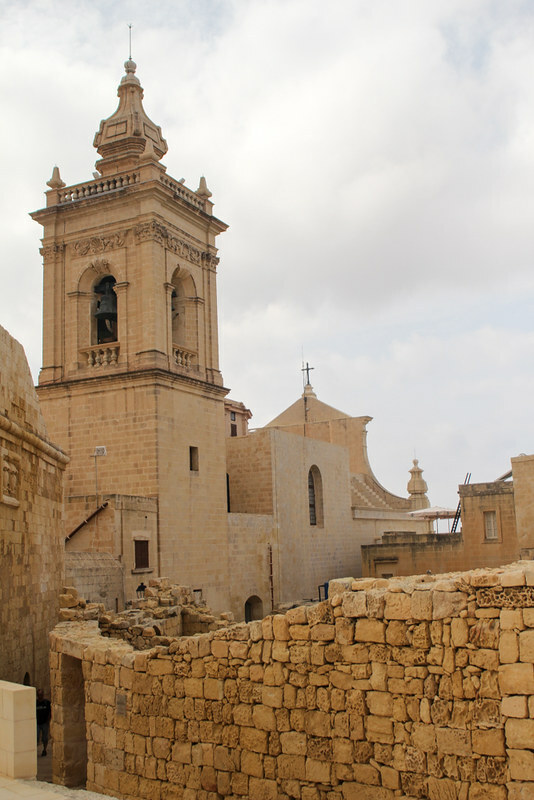 Did you know that in Malta you can find the oldest man-made structures on Earth? 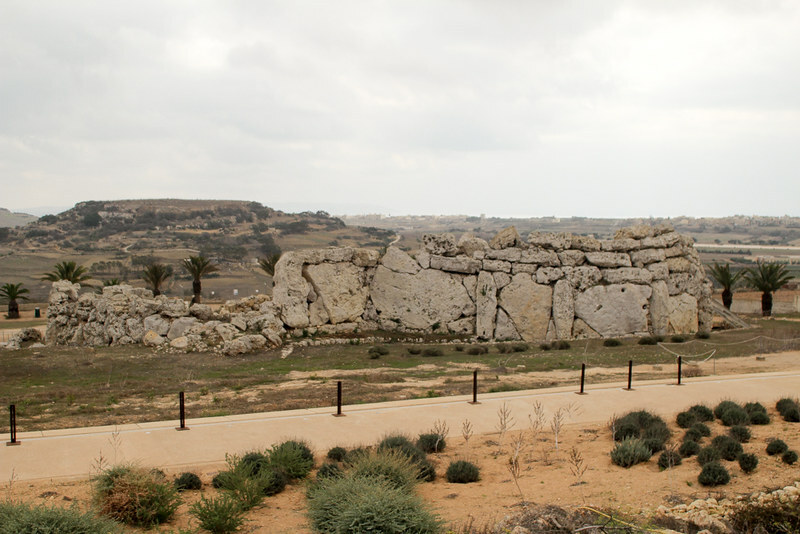 The Ġgantija temples are older than the pyramids of Egypt and Stonehenge! The temples themselves are in ruins and it’s hard to imagine how the clove shaped structure used to look thousands of years ago. Reading the cards and noticing little things like a hole in one of the doors made with a metal tool, when metal wasn’t discovered yet, gave me shivers. At the entrance to the temples is a museum where I found out more about the sculptures and also about lifestyle of our ancestors. I was astonished to find out that, for example, their diet was the same as ours: meat, milk, fresh vegetables and fruits. The sculptures showed that they used to wear clothes, not animals skins, women wore necklaces, waistbands and pleats. Isn’t it astonishing that archaeologists even found buttons? The people who built the megalithic temples of Malta might have been much more advanced than we thought. Next to the Ġgantija temples is an old windmill, Ta’ Kola (Nicholas’ Windmill) that can be visited with the same ticket. Although small, I was able to learn how Maltese house interiors looked hundreds of years ago. The windmill was in use until the 1960’s when the last miller died. From the outside it may appear small, but don´t let that fool you. The inside is quite spacious and airy. It was really interesting to climb the circular stairs all the way up to the top of the tower and observe the windmill mechanism. For lunch we went to Xlendi, a popular summer destination for the Maltese. This is where Therese introduced us to Maltese food. We sat at a restaurant right near the sea, overlooking the Xlendi Bay. The weather wasn’t as great as at the beginning of the day but it was still enjoyable to feel the salty Mediterranean breeze while having a glass of the local wine. 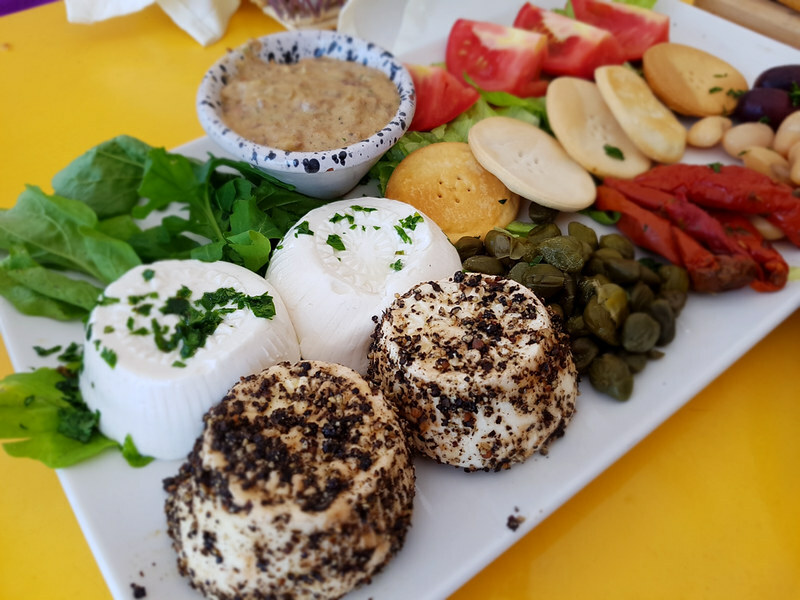 We started our lunch with the Gozian platter, a real medley of flavour and typical of the island: gbejniet tal-bzar (peppered mature cheese), fresh sheep’s cheese, galletti crackers, bigilla dip (broad beans, garlic and parsley), sundried and fresh tomatoes, olives and capers. It was accompanied by fresh baked bread with three dips: tomato paste, beans with parsley and a vegetable mix. Next we had ricotta-stuffed ravioli in tomato sauce and cheese ftira (a pizza look-a-like dish but with bread dough instead of the traditional Italian one). 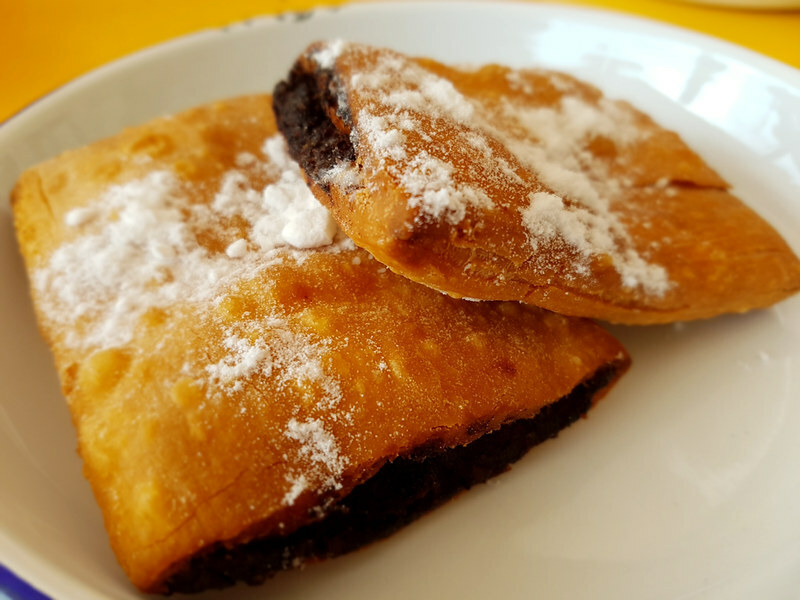 I still dream of that gbejniet tal-bzar and I would go back to Gozo just to have some more of it. With full stomachs we headed back to the car and Therese drove us to the most scenic part of the island. We first stopped at the incredible Wied il-Ghasri Valley (The Honey Valley). We got there by following an off-road track and then went down what seemed to be an infinite number of steps. There were only a few people around and the view seemed perfect, exactly like in the photos. The only thing missing was the sun and the blue sky, but the scenery was still breathtaking. A few divers were preparing to explore the hidden small caves down the creek and I can only imagine the beauty they’d seen. A voice inside my head was screaming “jump in, jump in”. But then I realized there are still plenty of places to be seem and I didn’t have any change of clothes with me. On our way to the final destination of the day, the Azure Window, we drove on top of the northern cliffs. I have to admit I was a little scared and didn’t have the courage to approach and sit on the edge for a photo. The cliffs are simply astonishing with almost vertical drops of what I estimated to be around 100 metres. The best part is that people actually fish from up there using nets and buckets. The sun was preparing to set when we arrived at the Azure Window, probably the most famous place in Gozo. If you have seen The Game of Thrones, you might know this is where Drogo and Daenerys had their wedding – well, where the filming took place. Therese was telling us that back then nobody knew who the actors were nor that the series would become so popular. Unfortunately the day had to end and we had to return to Malta. By the time Therese dropped me off at my hotel it was night already. I couldn’t believe how quickly the day passed, how many things I got to see and the new information I learned from Therese. 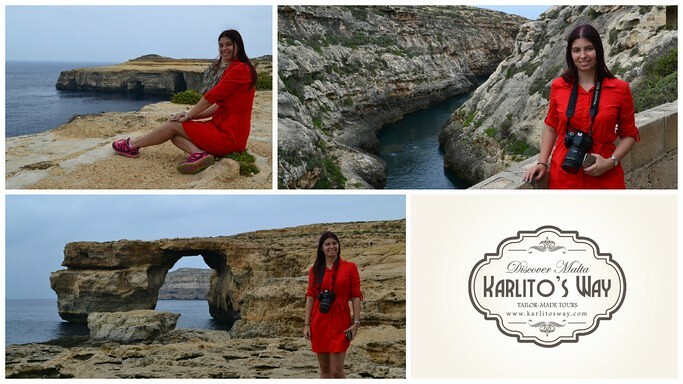 I really recommend Karlito’s Way if you want a truly local experience of Malta or Gozo. They have amazing tours that can be customised to your liking and they can organise any local activity for you. Disclaimer: Please note that I received the Gozo Tour complimentary. However, all comments and opinions in this article are my own. 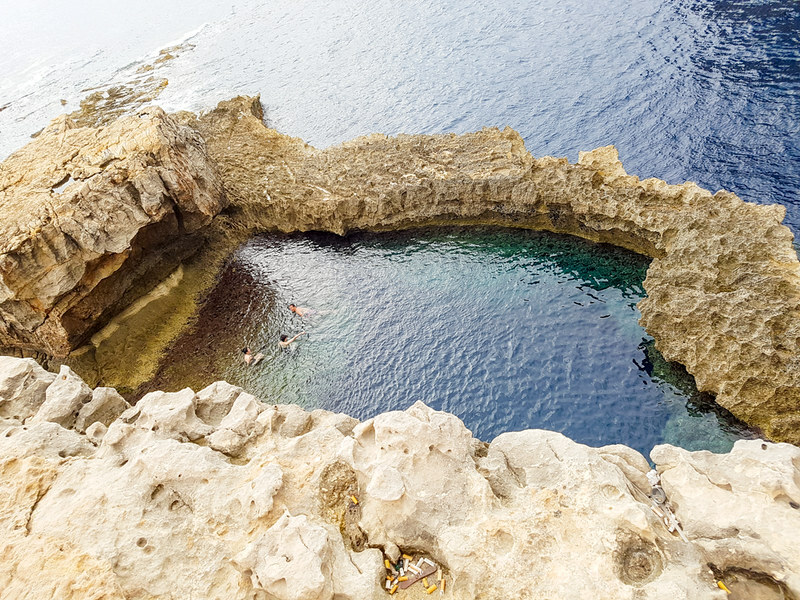 Swimming in the pool by the Azure Window looks so dreamy. I’d love to do that. Your photo of it is gorgeous! I love the architecture and the buildings there. The water is also amazing. Thank you for posting your photos too. While I heard of Malta before, I never heard of Gozo – it sounds more like something I would like to visit – I prefer peace and serenity during my vacations, there is enough hustle and energy in my day-to-day life – blessings! Wow! Gozo is such a beautiful city!! I love how you captured the architecture of the church and of the Cittadella! Also the Ġgantija temples are simply stunning!! 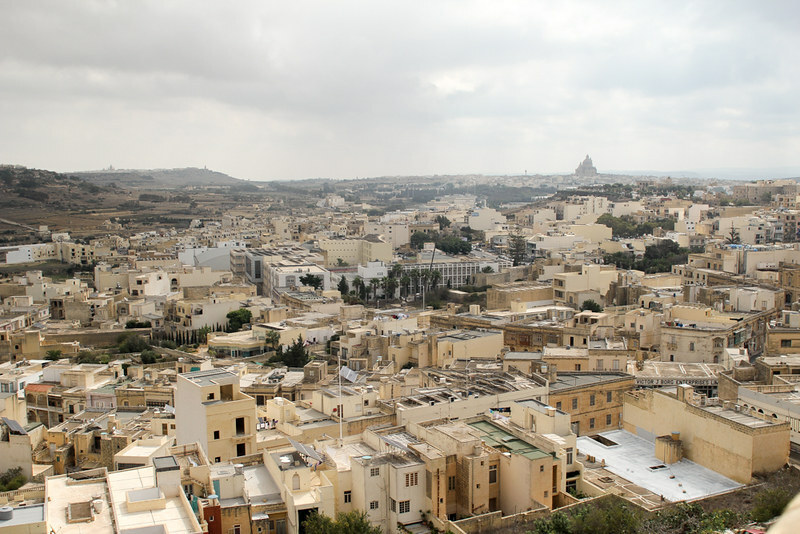 I had never heard about Gozo before, and I’m so glad I stumbled across your post! Thank you for sharing!! That’s a crazy bus ride to only make 8klms in an hour and a half! Your photos are stunning! The cliff formations remind me a lot of the Great Ocean Road in Australia. Truly spectacular. I think I need to put Malta and Gozo on my list. And for more than a long weekend ? Several years ago I was obsessed with travelling to Malta so now you rekindled that passion. 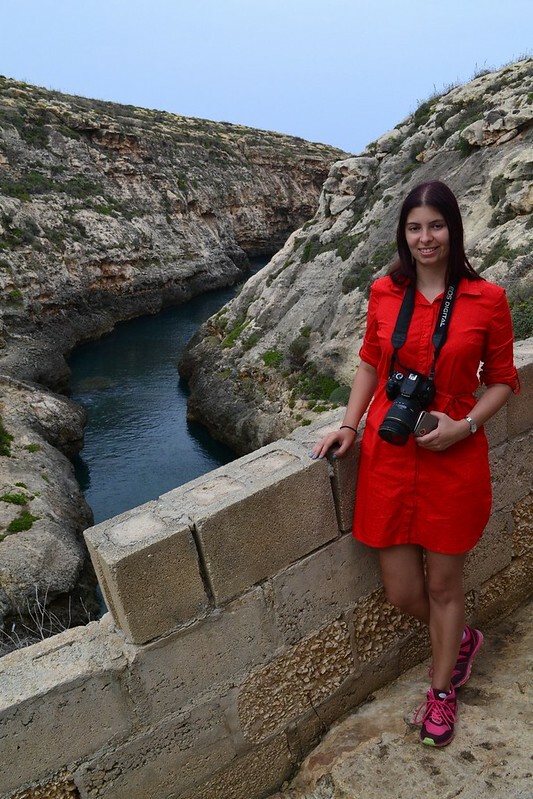 Photos of Gozo are spectacular and I’m glad you had a great experience with the tour company! I laughed when you commented about rentinng the car – is the traffic really that terrible in Malta? oh my god! This looks too damn beautiful and quite dreamy. I love the narration, especially the reference to balcony and Arabian nights. .. And food looks yummmmmmmmmmmmmmm! Hello, What a lovely article. I have not heard of Gozo and how you described how peaceful it is makes me want to book a flight now! 🙂 It sounds like a wonderful place for a retreat and to kick back enjoy life and relax. I’ve also never even thought of using a private tour guide. It sounds amazing the idea of swimming with Tuna or Baking bread! The people there sound so inviting and amazing and I only hope to make it there one day to experience it myself! Thank you for the really great information! Gozo is just so gorgeous. The Azure window actually reminds me a lot about Algarvae in Portugal. Was it really that bad to drive in Malta? I want to try Maltese food after seeing so many vegetarian options. Never knew that we could swim with Tuna till now. These tours arranged by locals are amazing. They give you every little insight on the place and every secret and you end up with tons of information and learning a lot (and with the feeling you’ll never finish writing your posts 😉 ) It’s absolutely my choice of travel, and I’ll start doing it more. I found it much more inspiring than rambling around a place with a travel guide, a map and no clue of what to do next. Great post, awesome Gozo and I am definitely placing this post among my favorites. I have Malta on my wish list and Karlito’s way can be the way to go!! Everything about this place — the architecture and the food – -looks amazing and beautiful! I never really considered Malta, and certainly never heard of Gozo before, but I would really consider it now! Thanks for your thorough review of this beautiful country! And yes, sometimes having to drive around with so much traffic can be too stressful. It really has an old world feel to it, I love those streets and the food looks delicious. What an extraordinary place to visit, everything about it is amazing, well, except for the time to travel 8 km. Lol, you could walk it in that time! Absolutely beautiful photos. Nice post. We lived in Malta for a year plus and visited Gozo. This captures it quite nicely. Wow- the azure Arch is so pretty and I love how blue the sea looks! I had no idea that there was a smaller island (Gozo) located right by Malta. Looks so pretty! I think I’ve read about Malta 4 times now in the last 2 days and it is REALLY making me want to visit! 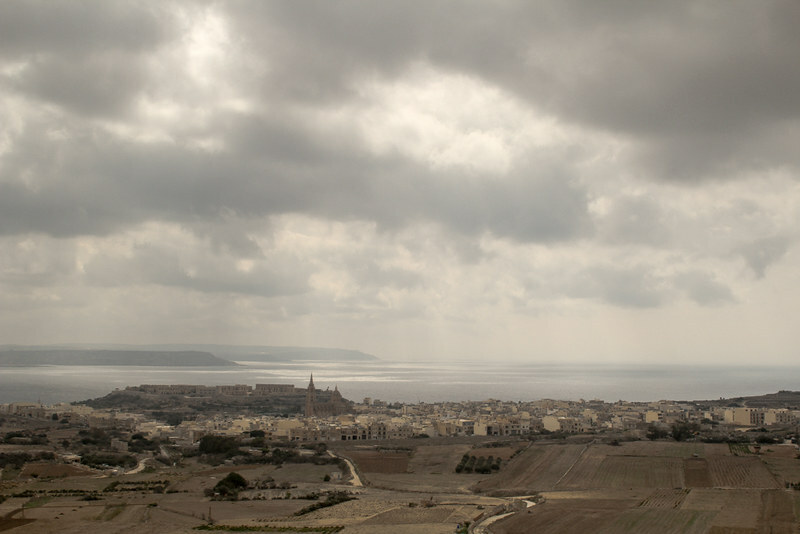 Your photos of Gozo are so charming! I love the water. I’ve heard of Malta but neve Gozo. The architecture and scenery is beautiful! I would never want to leave. The stone work, the cliff faces…they are all inspiring. Gozo sounds wonderful! I love it that’s it’s more peace and quite. Sometimes that’s exactly what you need. When even on a Saturday night the streets are quite, then it’s really a place to go to for some rest. The citadel of Gozo looks amazing. I rally love the picture. It looks so unique. So nice that the old prison is a museum now. If I ever go to Gozo, I’m sure I would want to see the The Ġgantija temples! So interesting to know the ancestors had the same diet. And wow.. I LOVE Game of Thrones. It’s just amazing that you went to the place where Drogo and Daenerys had their wedding. I really want to go there as well. Love the place! I am a big fan of Malta, and especially of Gozo. It is so much quieter and more peaceful than its larger ‘sister island.’ I hope to be able to go back soon. Never been to Malta before. However loved the photos. One day I will be there. By the way, I truly enjoy your blog post well written, detailed and I don’t find it drudging to read. I question why the bread is really important in Malta? I would also love to get invited into the fisherman’s house for lunch if I get the opportunity. Anyway, your trip to Gozo is really amazing, I didn’t get the probability of hearing about this place before and it was truly serene and the landscape are truly jaw-dropping. The buildings are well designed both interior and exterior. the architecture catches the eye ,so unique and strong, that’s the best of the ancient strength in design, gozo, name sounds strange but the post doesn’t anymore. You could not have done a better job of convincing me to visit. Between the architecture which is totally stunning and the amazing culinary delights, I’m nearly booking a trip right now. This place is so beautiful. The place where you stayed in is something that I’ll enjoy staying in too. I’ve never heard of Gozo before, I am from Manila, Philippines, you see. But someday, I hope I can visit this place too! 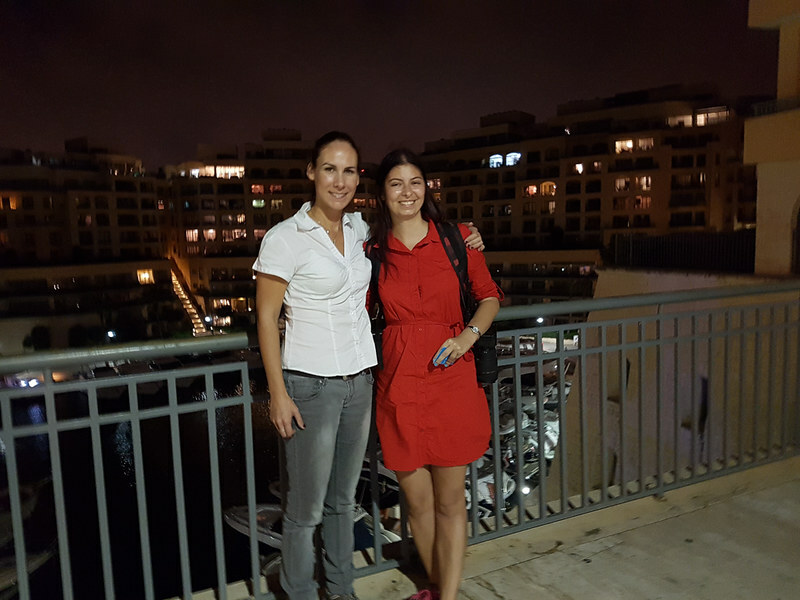 Thank you for sharing your Malta trip! Malta seems mysteriously beautiful for me (based on your photos and stories) and I think I will enjoy the trip like you do. I also like that kind of tailored-fit trip, were you have a chance to engage with locals and learn the local life… being invited by a local at their homes to dine with is such an honor! I love your capture of the church and the citadel! The architectures area really ancient and amazing… Honestly, when I saw the picture of the cityscape, I thought of Aladdin 🙂 It does remind you of the Arabian Nights! The Platter looks and sounds interesting too… Thank You for sharing this post, as I had never heard of Gozo or Malta before this read! Now this is definitely on my list! Amazing landscape. The rock formations stun me. I liked the old streets too. Hopefully I can visit too some day! I love this place. Beautiful pictures. I have an eye for good style so I couldn’t help but notice your beautiful dress. I love tours that adjust to your interests, that makes the travel even more worth it than it already is. This place is gorgeous and I love that she took you to the Azure Window! It’s really breathtaking! I love the tradition that some of countries have like the man going to ring the bells everyday at the church! I would never have thought to go to Gozo and your photographs are very inviting and nice and indeed! Is it difficult to get to Gozo? I’m going to Malta in July and hiring a car and was going to take the car to Gozo for the day using the ferry. I was going to go in the morning to make the most of the day, is there a time of day I need to avoid e.g. a rush hour? Beautiful!! 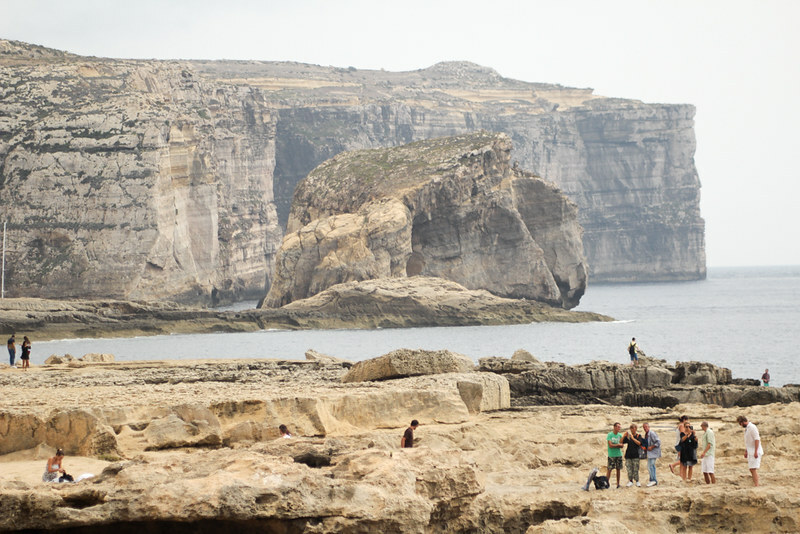 Gozo looks so gorgeous and is becoming such a popular destination! I want to go hopefully next summer! 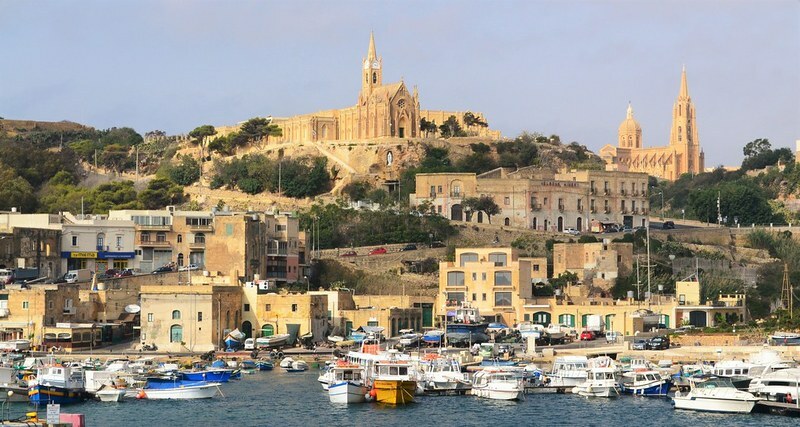 I have friends that travel to Malta quite often but have never heard of Gozo before! We do tours quite often when we explore new cities and countries, learning about places first hand from locals is great. Adding this to my destinations wish list! 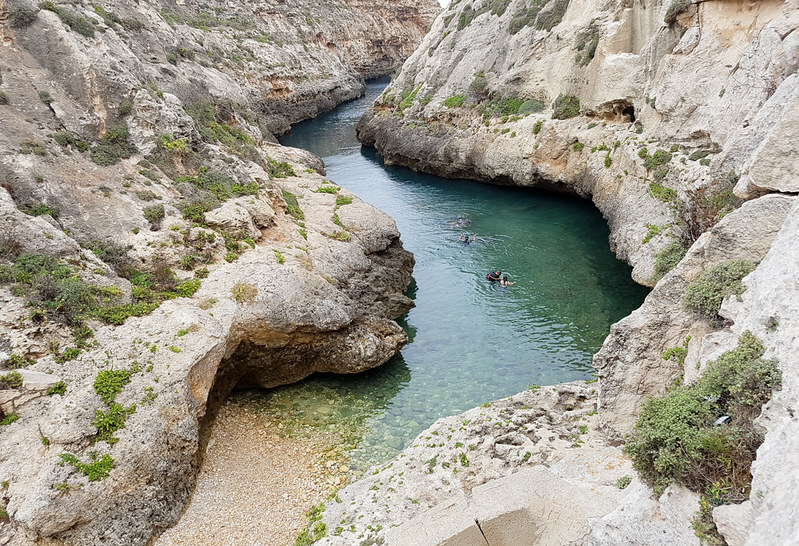 Gozo looks like such an amazing destination with so much to do.It is quiet, peaceful and the Maltese cuisine looks so tempting.Would love to do the cave exploring like the divers you mentioned. I never thought that Malta was that beautiful. As you said I wanted to go there for a weekend away from the city but omg there is so many things to see and do. Would love to go to Gozo as im history obsessed. I don’t know if I could have resisted not jumping in to all of those pools or rivers you passed! I mean I understand you were on a tour and probably didn’t want to sit in a car all wet but that water looks divine. Did you swim with the Tuna or eat Tuna with the fishermen in Malta? Gozo looks great too. I had only briefly heard of it, and I assumed it was a tiny island but your pics make it look pretty decent in size. How expensive was the food or extra activities outside of the tour? I have never been to Malta and hadn’t heard of Gozo! This looks like a beautiful retreat and relaxing for any traveller! The scenery is beautiful too. To be honest, I never imagined Malta to be so breathtaking. Your photos are stunning! Gozo sounds so nice! While I would still do Malta, I prefer to rub shoulders with the locals. Did you get to eat at the fisherman’s house or make bread? That is my dream!!! Gozo looks amazing. I actually considered Malta as a New Year’s destination this year and, had I read this sooner, it might have ended up higher on the list. 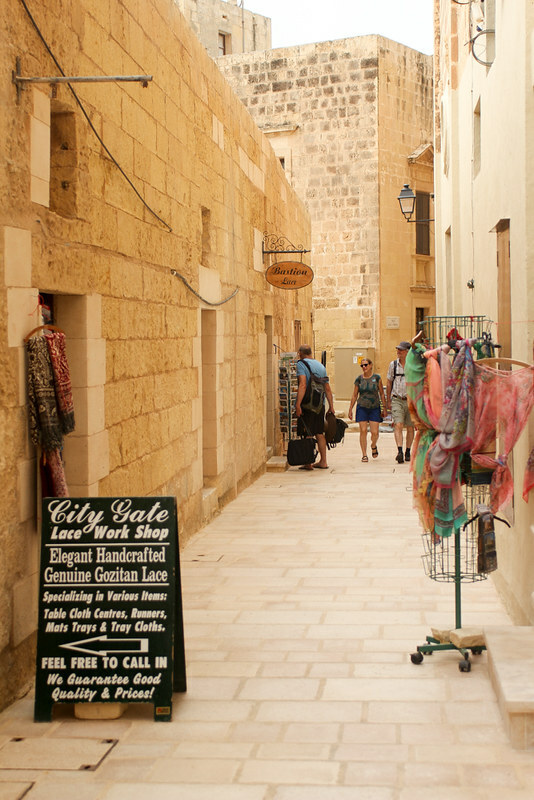 The area surrounding the Citadella looks full of culture and, no, I did not know that Malta housed the oldest man-made structures in the world! Wow, this is such a lovely little island. The streets and alleyways have a laid-back charm to them. And it is the first time I’ve had a glimpse of Maltese food. The Gozian platter looks lipsmacking. Wow! Malta and Gozo are both beautiful places! You’ve definitely captured their beauty on the photographs. The buildings are so classical and very elegant. Selfies and Photoshoots would be amazing there. It’s nice that you were able to point all the best selling points of the place. Great detail for tourists. Wow – what an incredible landscape! Gozo looks amazing! I had never thought about visiting it but it seems incredible! 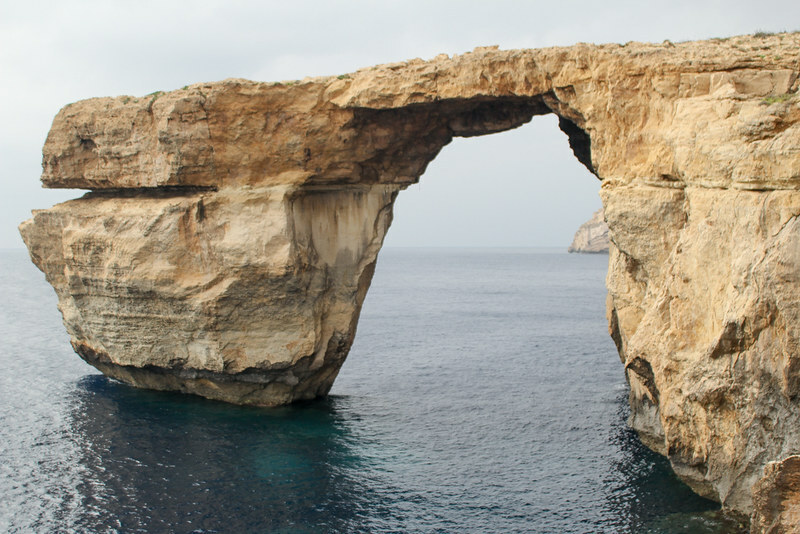 The Azure Window must have left your jaw on the floor – spectacular! I guess nowadays so many people want to visit because of GOT. The architecture here looks just incredible too, would love to visit some of the churches. Thanks for adding another place to my bucket list! Those cliffs are stunning! I could see why you’d be a little scared to go out and sit on them tho! We have been told to go to Malta, and with your awesome photos, we may go sooner! Wow Malta looks incredible! Gozo is so beautiful and full of character. Glad you wore your sneakers for this day – the tour seems really well planned and I will definitely be adding them to a list of future tour companies. I do not usually go on tours but your experience with them certainly reinforces that I should give them a go when in Malta! Thanks for sharing. Wow, Gozo looks and sounds incredible! Malta has been on our list for a while, so am hoping we get to see this in person. I love that the tour can be tailor made, and swimming with tunas is something I had never even heard of! Gozo is breathtakingly beautiful. With all these ancient places and its beautiful architectural style, if it weren’t for the occasional cars in your photos, I would have thought I’d stepped into another era. And the food looks so tasty! Its astonishing that you found holes in door made with metal tools when metal was’nt discovered and they even found buttons ! It could mean we know little about human history and there could be civilizations far advanced who would have lived thousands of years back. I love the clear waters of the Honey Valley ! Beautiful pics! I’m not sure if I’ve been to Gozo – somehow it looks a bit familiar and I know for sure that I’ve been to Malta a few times. Food looks delicious and Malta’s gastronomy is quite special. Gozo looks totally picuturesque.. I would love to explore this place that is replete with the rustic charm. Would add this one to my bucket list. This is a lovely island. It is always great to discover such relatively unknown gems. They become more charming because of the fact that they are off the beaten track and still retain much of their purity. I love taking private tours because they give peace of mind knowing you are going with someone very knowledgeable, while also feeling safe and not overwhelmed by some big tour group. I have heard of Malta before but never Gozo! Both places seem amazing and your photography skills are awesome! Makes me want to go even more! Nothing beats a quality tour operator that allows you a flexible and open itinerary. Swimming with tuna would be a pretty incredible experience! We had recently been to Malta and undeniably Malta has one of the incredible architecture and old world charms. 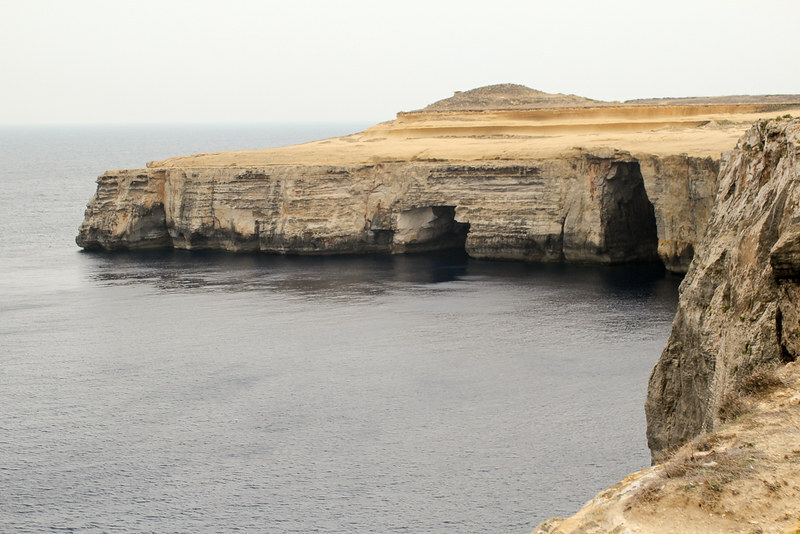 And the natural wonders of Gozo are unbeatable. We had rented a car to explore around and luckily the time we visited there was no traffic at all 🙂 When we visited in may this year the Cittadella was still under renovation lucky you that when you visited the work was completed. What a truly incredible part of the world and you certainly did a great job capturing it in your shots. And while I am not a viewer of Game of Thrones (I know, all my friends think I am a heathen too) it is easy to see why such a place has some much cinematic potential. But while Gozo is indeed beautiful, Malta as a whole is unspeakably beautiful. Hope you enjoyed the trip as much as it looked! amazing. I saw a natural swimming pool on the seafront. certainly very nice vacation there. I love the beautiful scenery in your picture, made fresh and happy. Maybe someday I’ll go on vacation there. Malta, in my opinion is feeling so romantic and exotic, especially in the Dwejra Bay capturing those interesting limestone formation. Gozo is so pretty and you described it correctly as Malta’s sister. They look so similar, yet such a world of a difference. What a great collection of pictures. Just made me think, only a few years back Malta used to be an unknown, un-talked of destination. I honestly haven’t seen much coverage on Malta but must say i am blown away! What is the average price of a private tour? Thanks! Interesting that you say that the best way to explore is a private tour. Is it difficult to move around on your own (internal transport/ costs)? Loved the pictures . The citadella sounds and looks really interesting. Would definitely be adding this to my wanderlist. Nice to see you checked out something that is shadowed by the popularity of Malta! Both are of course absolutely breathtaking! I always dream of strolling casually across streets that are dripping with history and culture! This place looks very relaxing! I’ve never heard of Gozo but looks like a nice travel. Amazing photos! I’d never heard about Gozo before I read your post. What a wonderful, quaint and beautiful place! The food also looks and sounds wonderful. I will certainly look up Karlito’s Way…I love a localised approach to discovering places and they sound perfect. Thanks for sharing! I’ve never heard of Gozo but it seems nice and relaxing. Also your photos are breathtaking. They look so crisp and clear, which camera are you using if you dont mind sharing? Lovey photos! Would also love to go there and have just stroll in the old street all day long. The landscapes are stunning and you made a very well shot with them. Gozo looks like a beautiful city to explore and yeah, it gives the vibes of the stories from the Arabian Nights! That Azure Window looks breathtaking and I’d definitely love to swim there! What a beautiful discovery! I also like the way you have shot the archetecture of the place from different angles. The Gozian platter platter iis mindblowing. Must be the most photogenic platter I have seen. I simply fell in love in this island. I really like visiting small charming islands like this one. The architecture looks amazing. 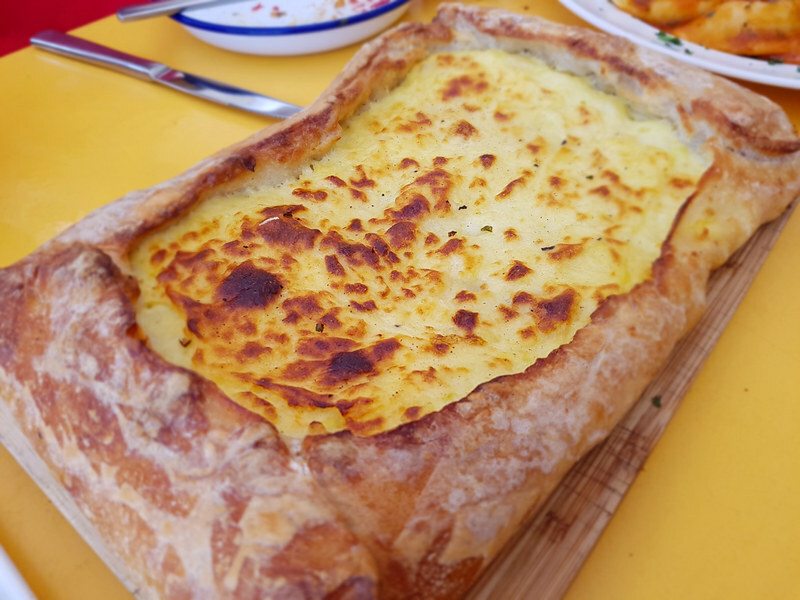 As I love cooking and baking, it would be great to take part in the classes and bake traditional Maltese bread. Hi! You’re looking at a care hire failure! 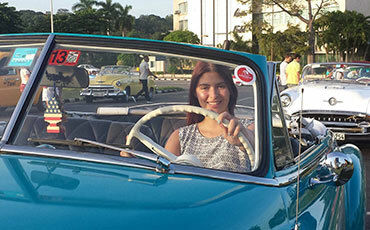 I crashed a rental car in Malaysia 5 minutes after leaving the lot! So, I see what you mean about having no desire to take the helm! The pictures in this post are stunning! What a beautiful place! I would love to visit Malta someday. It is sunny all year round. The beaches are breathtaking. Food looks delicious. I am sure the people are friendly and welcoming too. You are so lucky that you have been in this charming place already. Oh my goodness, Malta looks absolutely breathtaking! It looks like you really explored all of the nooks and crannies and ate some amazing food! Your photos bring it alive and I absolutely want to add it to my bucket list now!